WELCOME TO DUMKA: "The Green Garden"
Dumka is one of the oldest districts of Jharkhand state under Santha Parganass. This homeland of tribals is full of stunning landscapes, majestic mountains, verdant valleys and serpentine rivers. Dumka is situated in an idyllic surrounding of hill ranges, rivers and forests. 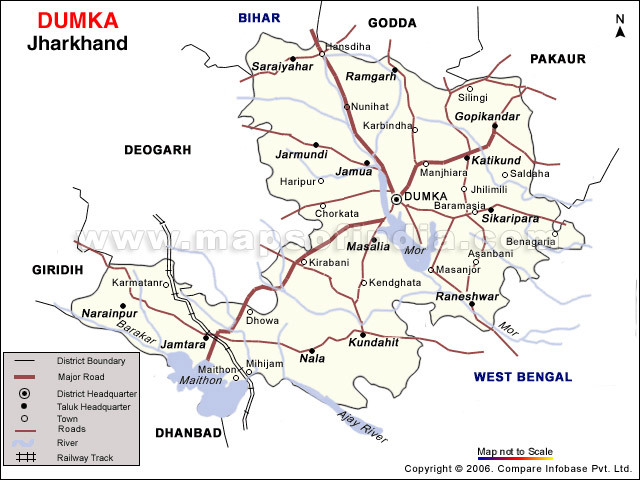 The District of Dumka is an upland tract with a hilly backbone running from North to South. Ramgarh Hills lies in South East of Dumka, Lagwa Hills near Nonihat, adds a fascinating charm to the beauty of the District and gives satisfaction of rare scenic beauty to those who toil hard to scale the heights of the mountain ranges. 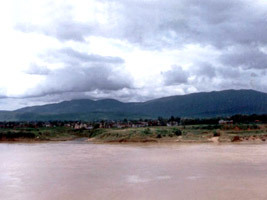 BABA BASUKINATH DHAM, MALLOOTI, BABA SUMESHWAR NATH, MASANJORE DAM, KURBA HILL, TATLOIE KUND, KUMDABAD, KATHIKUND, HILL RANGE etc. Rail: Nearest station is Jasidih which is 75 KM from Dumka city, It will soon be connected with Deoghar by rail . Road:Well connected with all the major cities by good roads. Airport: Nearest airport is Kolkata, Patna & Ranchi. 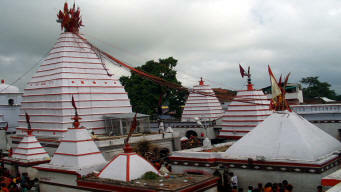 BABA BASUKINATH DHAM: Basukinath is located in Dumka District of Jharkhand. It lies on the Deoghar - Dumka state highway and is around 25 km north-west of Dumka. It is a place of pilgrimage for Hindus. Basukinath Temple is the main attraction here.Jasidih Junction Railway Station and Jamtara Railway Station are the nearest railheads. Ranchi Airport is the nearest airport. It is situated at Jarmundi Block on Dumka Deoghar State Highway at a distance of 24 km from the Distrcit Headquarters Dumka. In a year lacs and lacs people from different parts of country come here to worship Lord Shiva. 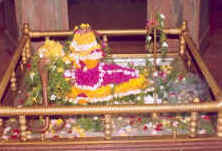 In the month of Shravan people of several country also come here to worship Lord Shiva. 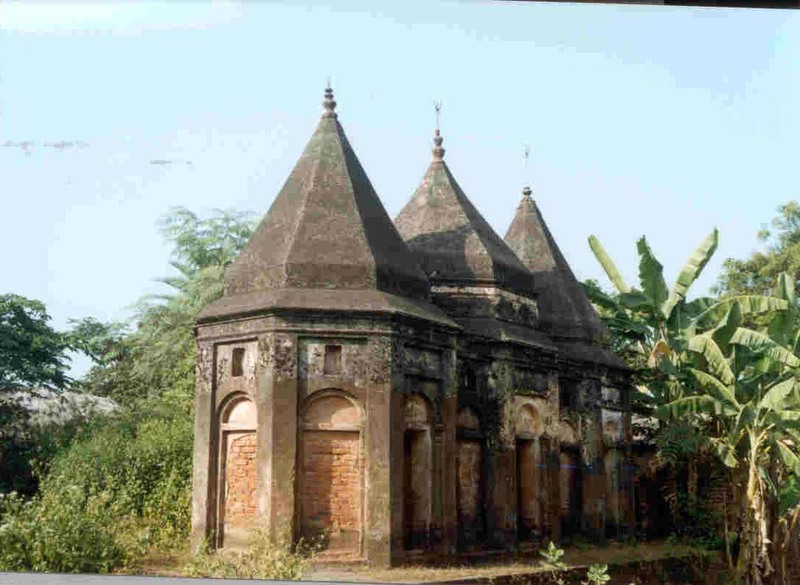 MALLOOTI: Mallooti is a historical and religious place which is situated in Shikaripara Block on Dumka Rampurhat interstate highway at a distance of 55 km from Dumka District Headquarters. In 1860 Mallooti was made taxfree capital by the then King Basant Rai alias Basant. This Mallooti is associated with the archaeological and religious importal place for natural beauty. MASANJORE DAM: Masanjor dame or the Pearson dame on rever Mayurakshi is a picturesque place on foot hills of long range of forest clad parallel hill ranges. This place is basically a hydro electric power generating center but in the process of time it has become popular center for the tourist. With the beautiful garden on the down hill and two beautiful Dak-bunglows on the bank of the river at charm to its beauty. BABA SUMESHWAR NATH: Baba Sumeshwar Nath is a religious place which is situated in Saraiyahat Block at the distance of 60 km from district headquarters Dumka. There is a big temple of the Lord Shiva. On the eve of Mahashivaratri the people of different parts of the district come here to worship Lord Shiva in addition to daily worshiping. 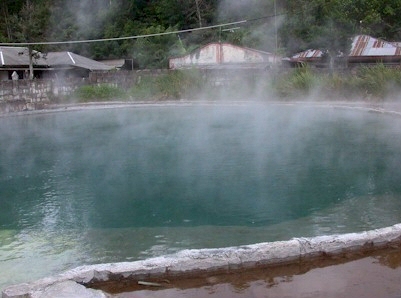 TATLOIE KUND: Tatloie is a hot water Spring, situated at a distance of 15 km from the district headquarters of Dumka. It is rounded by small mounts, beautiful, attractive and greenish natural atmosphere. The water of spring is very clear and healthy. 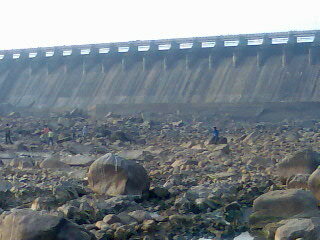 KUMDABAD: Kumdabad is a very beautiful picnic spot . Just 13 Kms. from the Dumka town , you find a rare view of natural beauty with small hills ,beside that smooth flowing river Mayurakshi. KATHIKUND: On Dumka-Pakur road , at a distance of around 25 kms. From the main town there is a block of kathikund. This place with very old establishment of sericulture and khadi production is surrounded by range hills and deep forests with a river passing between the valleys. 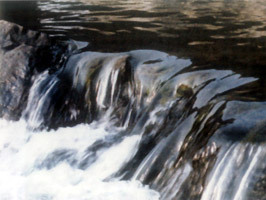 This topographical background provides numerous sites small and big for picnic. Some of the important spots in and around the Kathikund are Nargunj, Saldoha Laprocy mission, Mahuagadhi and Gopikandar. The site under Gambhara bridge is a fascinating point for outdoor photography. 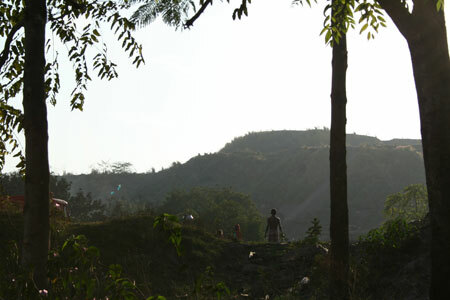 HILL RANGE: Running south from pakur to godda.The hill range of Dumka seen parallel & terminate in th Mangalbhanga hill. To the south east of Dumka is Ramgarh hills ferther west 2parallel renges of hills also stretch in an easterly direction from Masanjor to Ranibhal. Beside hill ranges some hillocks are also in like (i) Lagwa hil at Nonihat under which lies the Tatloi hot water stream (ii) Hijla hill top. (iii) Sapchala hill top. (iv) Chuto pahadi.Maluti (Temple villege on way to Rampurhat). HOT SPRINGS: Tharia Pani- Near Gopi kandar on Dumka-Pakur Road. max.40km from Dumka. Nunbil max.60km from Dumka-Dumka Jamtara road near Kundhit. Tapat Pani-Left bank of M. river.1.25miles of Kumrabad.Airodrum road near Dhadakiya. max.10km from Dumka. Susum Pani-Close to village baghmara on the opposite bank of Mayurakshi river.